The Fly-Fisher's Entomology, Illustrated by Coloured Representations of the Natural and Artificial Insect and Accompanied by a Few Observations and Instructions Relative to Trout-and-Grayling Fishing, first published in 1836 by Alfred Ronalds (1802–1860), was the first comprehensive work related to the entomology associated with fly fishing. Although the work was Ronalds' only book, it was published in 11 editions between 1836 and 1913 and has been extensively reprinted in the last 100 years. The Fly-fisher's Entomology is the archetype fly-fishing how-to book. Most fly-fishing historians credit Ronalds with setting a literature standard in 1836 that is still followed today. 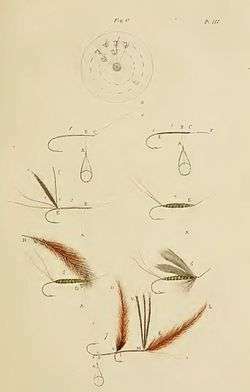 Describing methods, techniques and, most importantly, artificial flies, in a meaningful way for the angler and illustrating them in colour is a method of presentation that can be seen in most fly-fishing literature today. As the name implies, this book is mostly about the aquatic insects—mayflies, caddisflies and stoneflies—that trout and grayling feed on and their counterpart artificial imitations. Less than half the book (chapters I–III) is devoted to observations of trout, their behaviour, and the methods and techniques used to catch them. 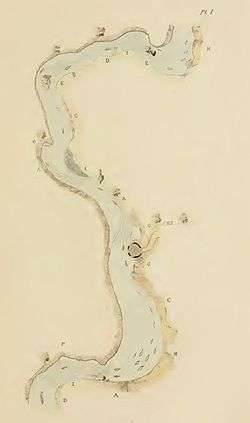 Most of this information, although enhanced by Ronalds' experiences and observations, was merely an enhancement of Charles Bowlker's Art of Angling (first published in 1774 but still in print in 1836). Ronalds introduced several new ideas, however, in Chapter I. His experiments and observations led him to describe and illustrate the trout's Window of vision, a concept an understanding of which is still essential today. Vincent Marinaro, in his classic work In the Ring of the Rise (1976), credits Ronalds with discovering and documenting this window and includes a reproduction of plate II–Optical diagrams in his book. Ronalds’ physicist brother Sir Francis Ronalds quantified the phenomenon for Alfred using his knowledge of optics. In the sub-chapter "Haunts", through discussion and illustration (plate I), Alfred Ronalds introduces the idea known today as reading the water to help the angler identify the most likely locations in the stream to find trout. No. 28. Green Drake [Plate XIII]. This fly, proceeding from a water nympha, lives three or four days as shown; then the female changes to the Grey Drake (No. 29. ), and the male to the Black Drake (see p. 89.). The Green Drake cannot be said to be in season quite three weeks on an average. Its season depends greatly upon the state of the weather; and it will be found earlier upon the slowly running parts of the stream (such as mill dams) than on the rapid places. Body. The middle part is of pale straw coloured floss silk, ribbed with silver twist. The extremities are of a brown peacock's herl, tied with light brown silk thread. Wings and Legs. Made buzz from a mottled feather of the mallard, stained olive. (See Dyes, Chap. II. p. 35. article 4.) To make it with wings in their state of rest, part of a feather similarly stained must be used, and a pale brown Bittern's hackle, or in case of need, a partridge feather must be wrapped round the same body under the wings. Alfred Ronalds was born in Highbury, London in 1802, the 11th of 12 children. His father was a successful merchant and his eldest brother, Sir Francis Ronalds, became famous for pioneering the electric telegraph. In 1817 at the age of 15, Ronalds took an apprenticeship as an engraver, lithographer and copper-plate printer. In 1830 he moved to Tixall, Staffordshire. He married his first wife, Margaret Bond, a local girl, in 1831. In Staffordshire, Ronalds took up the sport of fly fishing, learning the craft on the rivers Trent, Blythe and Dove. On the River Blythe, near what is today Creswell Green, Ronalds constructed a bankside fishing hut designed primarily as an observatory of trout behaviour in the river. From this hut, and elsewhere on his home rivers, Ronalds conducted experiments and formulated the ideas that eventually were published in The Fly-fisher's Entomology. He combined his knowledge of fly fishing with his skill as an engraver and printer, to lavish his work with 20 colour plates. In 1844, Ronalds moved his family to Dolgelly North Wales and in 1846 he moved to Brecon in South Wales, then to Cwmback, Llanalwedd, to become a full-time tackle maker and fly tier. In 1847, his first wife Margaret died during childbirth. In 1848 with six of his children, Ronalds moved to Melbourne, Australia and set up an engraving business. The gold rushes of the 1850 eventually found Ronalds settled in Ballarat, where he died suddenly of a stroke in 1860. He never returned to England. Chapter 1 – Observations On The Trout And Grayling. Chapter IV – Of a Selection of Insects, and Their Imitations, Used In Fly Fishing. Trout and Grayling - - Frontispiece. I. Haunts of the Trout, &c.
Ten years later  Ronalds produced his wonderful book. 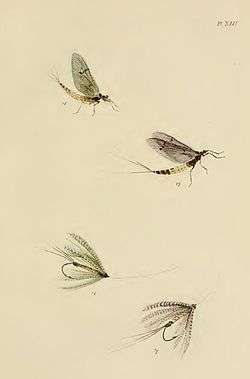 This gave coloured plates of natural and artificial flies, the naturals all classified and named. Few books have been more widely read, or had more influence. It went through eleven editions, the last, a sumptuous one, coming out as late as 1913. It started a school of writers and a school of thought. Though nearly one hundred years old it remains the only book of its class, and the world is still waiting for the benefactor who will bring it up to date. It is the textbook and in a sense the creator of the race of angler-naturalists. 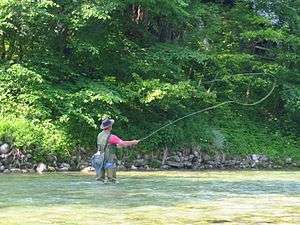 Ronalds is one of the major milestones in the entire literature of fly-fishing, and with his Entomology the scientific method has reached angling in full flower. Ronalds was completely original in its content and research, setting the yardstick for all subsequent discussion and illustration of aquatic fly hatches. The graphic work is beautifully executed, and the copper plates remain equal to most modern lithography. Ronalds is the prototypical mixture of angler and biologist that would appear again later in the nineteenth century, and continues to play a major role in contemporary thought. It's impossible to overstress the importance of Ronalds. Certainly he is the most significant figure in fly fishing after Cotton whom he followed by a hundred and sixty years. And while The Complete Angler was of course unique in it impact on the literary world, and will undoubtably alway remain so, it is safe to say that no single book ever had the revolutionary effect on the angling world--that is, the actual practice of angling, as opposed to the recording of it annals--of The Fly-fisher's Entomology in 1836. Time and hindsight can be harsh judges of flyfishing literature. Only a few works in any era survive beyond it to become cherished milestones of the sport's development. Sometimes they are valued for breakthroughs in knowledge and practice, sometimes for superb writing, presentation and appearance, and very occasionally for both. High on this most elite list is Alfred Ronalds' The Fly-Fisher's Entomology. Although this classic study was published in England in 1836, its importance reaches far beyond that place and era. Ronalds was decades ahead of his time, establishing paths that many of the greatest 20th century anglers would follow. Comparing the natural to its imitation seems an obvious approach, but no one before, or for many years thereafter, did the job effectively. In truth, first Bowlker and then Ronalds developed the style of modern treatments replete today with excellent color photographs, charts, graphs and the like. From: Westwood, T.; Satchell (1883). Bibliotheca Piscatoria. London: W. Satchell. Black, William C. (2010). Gentlemen Preferred Dry Flies--The Dry Fly and The Nymph, Evolution and Conflict. Albuquerque, NM: University of New Mexico Press. ISBN 978-0-8263-4795-4. ↑ Marinaro, Vincent C. (1976). In the Ring of the Rise. New York: Crown Publishers Inc. pp. 12–13. ISBN 0-517-52550-X. 1 2 Black, William C. (2010). "Ronalds Brings The Science". Gentlemen Preferred Dry Flies--The Dry Fly and The Nymph, Evolution and Conflict. Albuquerque, NM: University of New Mexico Press. pp. 31–38. ISBN 978-0-8263-4795-4. ↑ Ronalds, Alfred (1849). The Fly-fisher's Entomology (4th ed.). London: Longman, Brown, Green and Longmans. 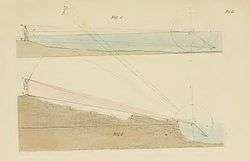 p. 87. 1 2 3 4 "Fly Fishing History-Alfred Ronalds". Retrieved 2011-06-21. ↑ Ronalds, Alfred (1836). The Fly-fisher’s Entomology. London: Longmans. pp. vi–vii. ↑ Hills, John Waller (1921). A History of Fly Fishing for Trout (1st ed.). London: Phillip Allan & Co. p. 179. ↑ Gingrich, Arnold (1974). The Fishing In Print-A Guided Tour Through Five Centuries of Angling Literature. New York: Winchester Press. p. 112. ISBN 0-87691-157-2.